Get our newsletter directly into your inbox and stay updated! The process of identifying your proper bow size for archery only takes a few moments but some folks make it look like rocket science. In reality it only takes 5 to 10 minutes to educate yourself in determining the correct bow size for you or your child. After reading through the following pages you will have all the information you need to make proper equipment selections. Remember, the salesman just needs to do his job which is...make a sale. If you skip these steps there is a good chance you will end up with something that will not be correctly sized for you. I know this to be true because I have personally re-outfitted hundreds of archers who made impulse purchases from the local archery pro-shop or big box store. If I had a dollar for every child that showed up at one of my youth archery camps or lessons who was "over bowed", or had the wrong size bow for their actual draw length, I could afford a two week vacation in the Bahamas. Countless hours have been lost re-educating parents on this one topic alone when the time should have been spent teaching how to shoot. The bow MUST be properly sized for the archer or the experience will be physically painful, frustrating and an expensive loss. 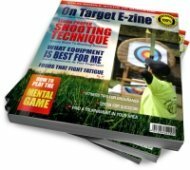 Do you want your archery equipment to be used or looked at? If you take a moment to educate yourself you will enjoy countless hours of satisfaction and have a positive archery experience! Follow these simple steps and you can be rest assured that your new bow will not end up in a dark closet or hanging on a wall collecting dust bunnies. Before we get started there are a couple or rules you should be aware of...or as I call them, archery myths. Myth No. 1 - "Height is equal to arm span"
Bow size charts based on height suggest that "arm-span is equal to height". According to the Journals of Human Kinetics, there is no evidence to support this claim. Test it: If you stand three people of the same height next to each other and measured their arm-spans you will likely come up with three different numbers. FACT: Using a chart based on height will not always yield desirable results, but your odds of choosing the proper bow size is a little better than selecting a bow based on age. Myth No. 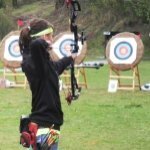 2 - "Proper Bow size can be determined by age"
If you are looking at a chart that uses age as the determining factor for selecting the proper bow size - THROW IT OUT! We are not all created equal in size and everyone grows at different rates. Using a chart that recommends bow sizes based on age is risky. Using a chart that recommends bow size by age is as intelligent as a "one-size-fits-all" pair of shoes. Think about it - regardless of what any one tells you, the proper bow size is as unique to the individual as a pair of shoes. FACT: There is no evidence that Arm span is proportionate to age. How do I select the proper size bow? To select a bow that will be perfect for you, all you need to know is your calculated draw length OR actual draw length. If you do not already know your calculated draw length go here then come back to this page. Now that you know your calculated draw length you can move on to selecting the appropriate size bow. Match your calculated draw length to the appropriate bow size in the chart to the left. NOTE: I always round the calculated draw length up to the nearest 1/2" inch for recurve bows. It is preferable to shoot a longer bow than one that might be too short. Go here to learn more about why determining your proper equipment is important in archery. OK, that was pretty straight forward. By determining your proper bow size you now know exactly what size bow you need. Before you head off to purchase your new bow you should understand that there are two kinds of sales people that you will encounter. The salesperson that really wants to help you make the right purchase. The salesperson that just wants you to make a purchase. You will know when you have met the second type of salesperson because they will do everything to convince you that whatever happens to be in stock, at that very moment, will be the right size bow and the proper draw weight for you. If you walk out with a bow that is too long, too short or you are overbowed (draw weight is too high) then you will regret your purchase immediately. Nothing...and I mean absolutely nothing will make your archery learning experience more miserable than trying to learn good archery technique when you are over bowed. Do You Have A Question About Selecting Your Proper Bow Size? My height and my arm span are identical (5'10").